Using metallic salts of Aluminium, Iron or Copper for mordanting is controversial in craft plant dyeing as these are all toxic to some extent, both to humans and other forms of life. If used and disposed of with care, the risks can be reduced [See Carrie Sundra’s blog] but many people choose to avoid using metal-based mordants completely. As a result there has been growing demand to find safer alternative “bio mordants”. Promising plant substances include Myrobalan, various tannins, Curcumin (from turmeric) and Lawson (from henna). 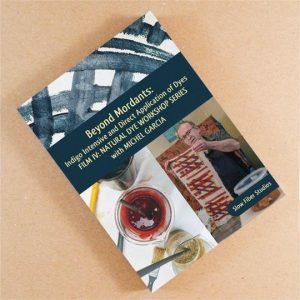 In this latest DVD Michel Garcia addresses this gap in current knowledge and shows how to dye and print without using metal mordants. Slow Fiber’s DVDs are packed with information and can be watched over and over again. They are aesthetic, gentle, informative and a perfect antidote to a stressful world. A friend, Aviva Leigh from Norfolk was the first to introduce us to their work. 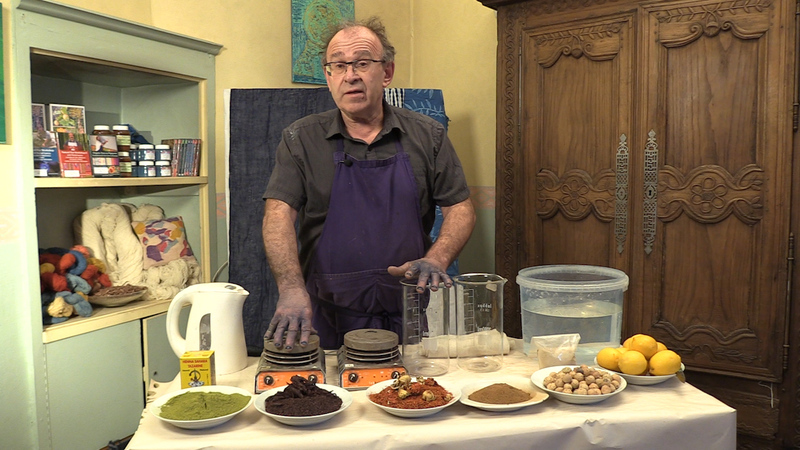 She says the mark of a true plant dyeing friend is someone with whom you can, with eager anticipation, settle down for an evening of re-watching Michel and Yoshiko’s DVDs, just as others would watch the latest Hollywood blockbuster! The films are soul-food for the craft plant dyer. It’ll be very exciting to see plants from our dye garden (our babies!!) on screen! If, like us, you are keen to understand the science of plant dyeing and mordanting in particular, a new book by Catherine Ellis and Joy Boutrup’s comes highly recommended. 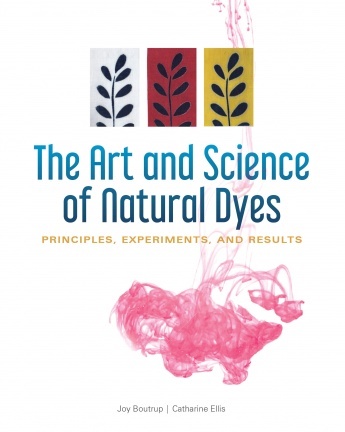 The Art and Science of Natural Dyes: Principles, Experiments and Results by Joy Boutrup and Catharine Ellis. This book has now been released for sale (January 2019). Catharine Ellis is a weaver, dyer and author of international repute based in North Carolina. She specialises in systematic experiments in her craft and teaches through Slow Fiber Studios. Many readers will be familiar with Catharine’s excellent website (see here). Joy Boutrup, from Denmark, lectures in textile technology for fashion design and for museum conservation. Both women have longstanding and impressive careers in their respective fields. It’s our feeling that both the DVD and this book will be landmark publications, marking a step-change in the systematic knowledge available to the craft plant dyer. So don’t be put off by the prices (Beyond Mordants $52, The Art and Science of Natural Dyes $60). In our own small way, we hope that the observations that inform our blog are a useful information source, and it’s free! But essentially we provide small snippets of data. Collecting all of that information together into a structured form, providing an expert overview and binding it into a professionally referenced book or instructional DVD takes time and money. It is my hope that one day I will have amassed enough information about growing dye plants to make it possible to write a book on the subject myself but it will take many more years of growing, observation and experimentation to get to that point. I can only imagine how much work has gone into the two publications above. Even though I haven’t seen them at the time of writing, I feel confident to recommend them. They are the work of leading experts in the field and I for one can’t wait to get my hands on them! 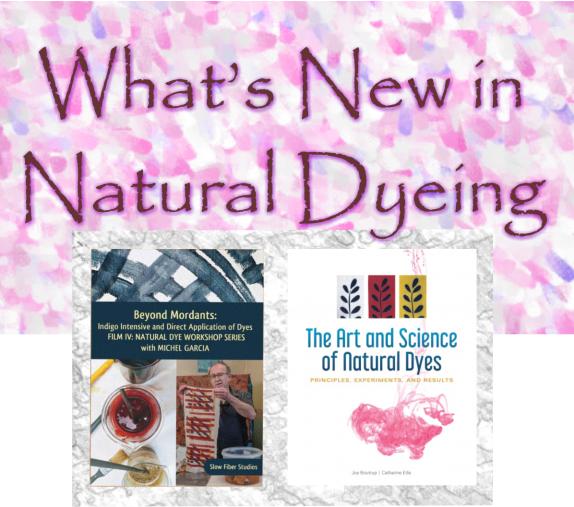 This entry was posted in Ashley's posts, Beyond Mordants DVD and The Art and Science of Natural Dyes, Catherine Ellis, Joy Boutrup, Michel Garcia, Susan's Posts on 24th January 2019 by susan dye.